All Metrorail lines will be crowded and experience delays during President-elect Donald Trump's inauguration Friday and the Women's March on Washington Saturday, but it's still a great option for getting to events. With all the road closures downtown, driving there will be a nightmare. Plenty of us at News4 use Metro daily, so we've got some advice for out-of-towners and locals who don't usually use Metro. Which Station Should I Use for the Inauguration? Metrorail will be open from 4 a.m. to midnight Friday, running peak service from 4 a.m. to 9 p.m.
Five Metro stations -- Federal Triangle, Mt. Vernon Square, National Archives, Pentagon and Smithsonian -- will be closed Friday for security reasons. 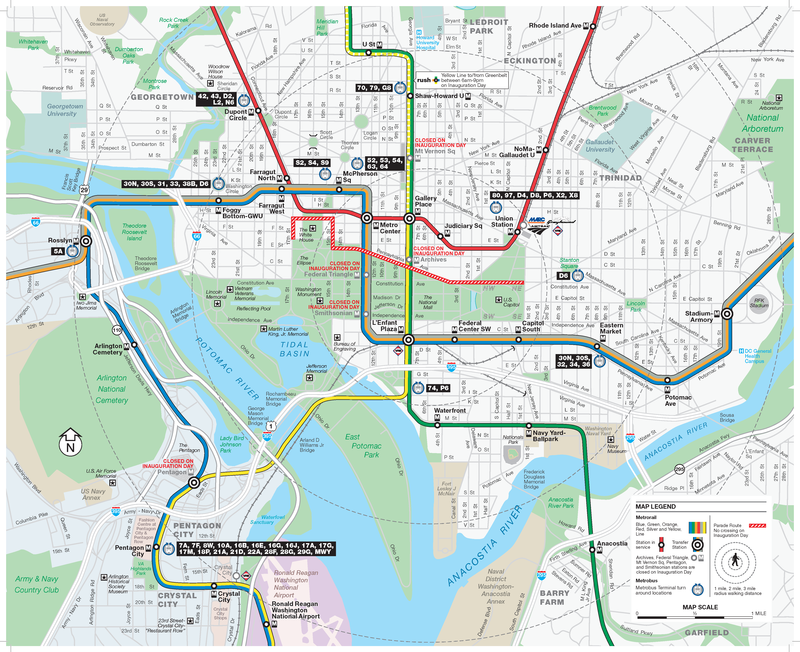 Metro compiled a list of best routes to the inauguration and walking directions from stations. How About for the Women's March? Metro advises anyone taking the train to the march use the L'Enfant Plaza or Capitol South stations to avoid crowding. The transit system announced late Friday afternoon that the Federal Triangle station will be closed Saturday; the nearest alternative is Metro Center. Metrorail will open two hours early at 5 a.m. Saturday and run as many as two dozen additional trains on the Red, Orange and Yellow lines. Riders can expect trains every 4 to 6 minutes on every line, Metro said. Stand to the right, please. If you're standing on a moving escalator, stay to the right to let others pass and lessen crowding on platforms and mezzanines. Stand for senior citizens, pregnant women, people with special needs, etc. Let them have your seat. After all, what could be a better occasion to be selfless and neighborly? Don't stand at the end of the escalator as soon as you get off it. That thing keeps moving, so take a few steps away from it before stopping to consider your next direction. Traveling with a stroller? Please use the elevator to avoid blocking the escalator. Metro calls this the best piece of advice for big events, and not everyone will heed it. But you don't want to be in one of those long lines at the fare machines as trains you wish you were boarding come and go. If you don't have a SmarTrip card, now is a good time to get one. Use Metro's Trip Planner to find out what your fare will be to and from your destinations and make sure you already have enough on your card before you go. If you already have a SmartTrip but don't have an online account, create one so you can add to your card online. All riders ages 5 and older need a fare card. Planning to Park at a Metro Station? Parking will dry up quickly, so get there early and have a backup plan in case your parking facility is full. Remember cash is not accepted. You can pay with a SmarTrip card or credit card. Metro will be crowded, so to make a little more space, the transit agency is banning bikes and large coolers and containers on trains. As always, eating, drinking and smoking are prohibited in Metro vehicles or stations. Obviously, Metrobuses are subjected to the same road closures as other traffic. Security perimeters will be set up beginning Thursday, affecting more than 50 Metrobus routes on a rolling basis. Some route changes will last until Saturday or Sunday. Temporary bus stops will be set up around the security perimeter where buses will turn around. You can find the turnaround locations on this map. The Pentagon Transit Center will be closed Friday. Routes normally running to or from there will begin or end at Pentagon City. Find a complete list of Metrobus changes here.